អត្តសញ្ញាណជាតិនៃកម្ពុជា រាប់បញ្ចូលនូវ the ancient monument of អង្គរវត្ត, ទង់ជាតិ ភ្លេងជាតិ និង the national emblem and royal arms. ក្នុងឆ្នាំ២០០៥ ព្រះរាជាណាចក្រកម្ពុជា designated seven flora and fauna as national symbols in an effort to promote nationalism and protection and conservation of these plants and animals. The sugar palm, Borassus flabellifer, and អង្គរវត្ត are two symbols of កម្ពុជា; the latter is also portrayed on the flag of កម្ពុជា. 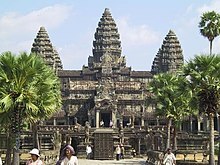 អង្គរវត្ត is a temple complex at Angkor, កម្ពុជា, built for the king Suryavarman II in the early 12th century as his state temple and capital city. It appears in the national flag of កម្ពុជា and as is often used as a symbol in print, signs, and media. "នគររាជ" ( Royal Kingdom) is the ភ្លេងជាតិ of the Kingdom of កម្ពុជា. It was based on a កម្ពុជាn folk tune and written by Chuon Nath, the anthem was originally adopted in 1941 and reconfirmed in 1947, around the time of independence from France. In 1970, the monarchy was abolished, thereby replacing the anthem as well. After the communist victory in 1975, former royalist symbols, including "Nokor Reach", were reinstated for a short while. The Khmer Rouge then replaced it with Dap Prampi Mesa Chokchey ("Glorious Seventeenth of April"). After the royalist party FUNCINPEC defeated the former communists (កម្ពុជាn People's Party) in the 1993 elections, the royalist anthem was restored.